Last week, we talked a bit about Meaford’s community gardens. Meaford’s also lucky to have a seed library housed, appropriately, in the history room of the Meaford Public Library. The initial collection came from more than 700 vegetable and flower seed packets donated by Metro Grocery to Golden Town Outreach, and it will continue to grow as each season produces more new growth and seeds. Just drop into the library to find out more. Small community garden plots were on the list of desired features at Meaford Haven for many of our virtual focus group respondents . But in Meaford, community gardening opportunities abound. Three years ago, a group of citizens created Meaford’s first community garden at Georgian Bay Secondary School (GBSS), with the goal of education and developing the skills required to produce quality, fresh, locally-grown foods and encouraging people to enjoy it as part of their everyday diet. Transition Meaford, Golden Town Outreach (GTO) and the students and teachers at GBSS collaborated on the project, and a year later they opened up space for private gardeners to grow their own food along with food for the GTO Foodbank. Then, in 2013, two new gardens cropped up: the “Village Green” at Victoria Village and another at the Church of the Nazarene, where GTO’s Foodbank is located. The expansion included raised beds, a tree nursery, a communal tomato patch and rhubarb. And that year, the group also received a Spark advocacy grant from the Heart and Stroke Foundation. 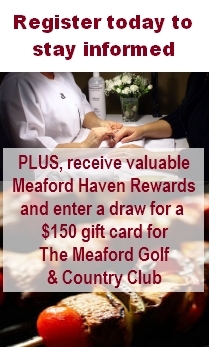 The group is looking for interest and participation from Meaford residents. “But it’s about people, not money. We’re looking for enthusiastic citizens who want to be part of the dynamic and rewarding effort to localize food production so that fresh, organic produce is available to everyone.” To get involved, contact Jaden Calvert at jaden@mail.uoguelph.ca or at 519.538.0628. The Meaford Community Gardens Market will continue to run on Thursdays from 5 to 7 p.m. at the Church of the Nazarene on Trowbridge Street until the produce is gone. Gardening in a retirement community? Yes and no. It seems that even for those who love gardening, retirement’s the time to scale back on the work involved. Your prospective neighbours at Meaford Haven have shared their ideas on gardening at this Ontario retirement community, and while roughly half of those who replied to our questions are interested in having them, the general consensus is that Meaford Haven’s garden plots remain small, easy to tend, and tucked out of the way. Private nooks and “secret gardens” mean those who wish to get their hands in the dirt don’t need to be on display to passersby as they putter away, and those who want to simply enjoy the fruits (and flowers) of their efforts can go on a garden stroll. Future residents who’d like to garden suggested hose spigots, rainwater collectors, orienting the beds correctly for sun exposure, and solar-powered lights for evening strolls. “I currently garden two acres of lawn and gardens,” said one soon-to-be-retired gardener. 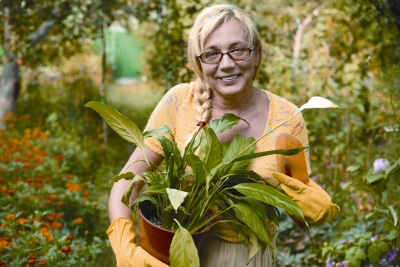 “By the time I move from my present home I will have gardened enough for two lifetimes.” This gardener will be able to relax, and for those of you who love gardening, you’ll find your own little space. And you can still let us know what you think. Sign up here. Good news for gardeners. Frank Kershaw’s coming to town on Monday night to share his thoughts on Good Garden Design. Presented by the Meaford Garden Club and Thornbury’s 599 Garden Club, Kershaw’s presentation will include fundamental design concepts, new ideas and trends, breathtaking photos of gardens far and near, and a healthy dose of humour. 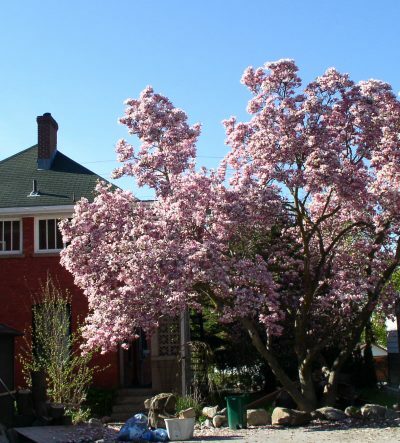 Kershaw’s own garden is a wonder, and was featured in both the first issue of Canadian Gardening in 1990 and in the 20th anniversary issue. He teaches the fundamentals of garden design at George Brown College and the Toronto Botanical Gardens, and he writes for a variety of gardening publications. The Meaford Garden Club meets once a month at Meaford Hall in the North Gallery and welcomes all ages and levels of gardening expertise – as long as you have an interest in gardening! Kershaw’s presentation takes place at Meaford Hall, Monday at 7 p.m., and it’s a great deal at only $10 plus HST. Box office. A couple of days ago, we met Shawn Phelps in this blog. When we talked, Shawn mentioned that when her father retired, he found himself suddenly at loose ends, and actually got sick. He had to find a hobby – something to do. In his case, it was stock trading, but he also walks, works out at the gym, and gardens – growing ferns and roses and helping out in Shawn’s permaculture garden. 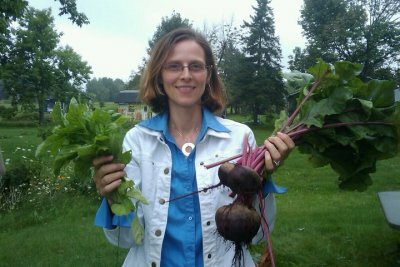 While ecological and ethical permaculture gardening is Shawn Phelps’s passion, she has additional ideas on how to make gardening an easy, active and popular active at Meaford Haven. Visit Shawn’s website at www.shawnphelps.com. 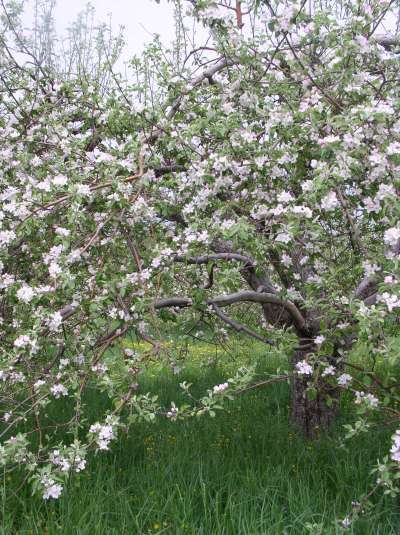 In the blink of an eye, it seems, Meaford’s apple (and cherry) trees are in blossom, and a stroll by one of our orchards can intoxicate you with the scent. As early as 1837, settlers on Cape Rich, just northwest of Meaford, had planted McIntosh Red apple seedlings they’d brought with them. They’d planned to be able to harvest the apples from a few trees for themselves, maybe selling a few here and there. 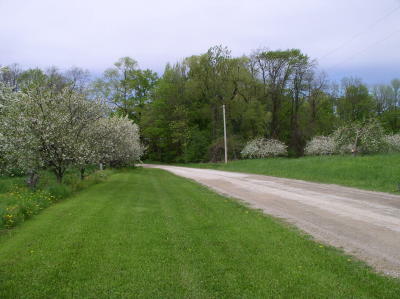 But their small orchard soon revealed that the region was perfect for apple growing, with the moderating influence of the Bay and the steep rise of the Niagara Escarpment cradling the microclimate. And it was the beginning of the Southern Georgian Bay apple growing industry. Today, while industry pressures and new growing practices have brought changes to the traditional apple orchard, you can still pull into your favourite local orchard for such popular varieties as Northern Spy, Russet and McIntosh Red, as well as Empire, Gala, Honey Crisp and others. 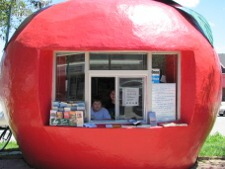 Meaford’s connection to the apple industry is apparent in our tourism booth – a ripe red apple on the main street – and in the Municipality’s new slogan: “the other big apple”. And in the last few years, a delightful byproduct of our local apples, Peeler Cider, has been growing (pun intended) in popularity. More on that soon. 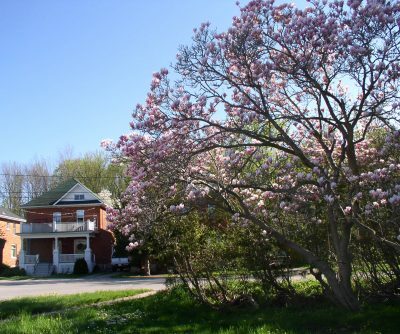 Nestled between Georgian Bay and the Niagara Escarpment, Meaford enjoys a microclimate that’s perfect for growing apples. The water of the Bay changes temperature slowly as the seasons change. That moderates the air temperature, making it less likely we’ll have a late spring or early autumn frost. 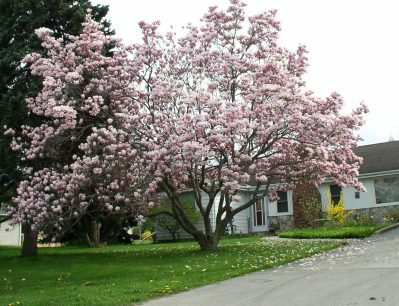 That same climate means magnolias can grow here, much farther north than you’d expect to find them in Ontario. We’re inviting a local gardener to share some observations on gardening in Meaford very soon.